This is the hard part. It’s a seven-hour drive from Seattle, six from Portland. You can fly into a regional airport to get closer; we recommend Lewiston–Nez Perce County Airport (LWS); Walla Walla Regional Airport (ALW) in Walla Walla, Washington; and Eastern Oregon Regional Airport (PDT) in Pendleton, Oregon. Closest major airports are Tri-Cities Airport (PSC) in Pasco, Washington, or Boise Airport (BOI) in Boise. A rental car, preferably four-wheel-drive, is a must. The Jennings Hotel Currently five rooms that can be booked through Airbnb. From $79. 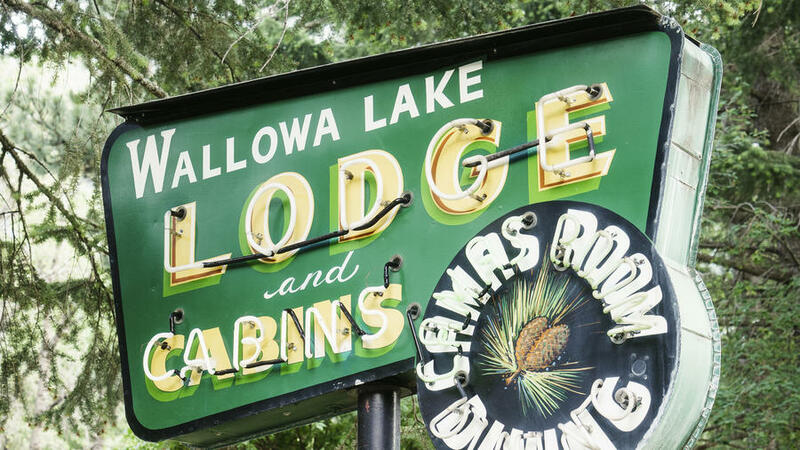 Wallowa Lake Lodge Lakefront lodging in Joseph with 1923 charm. The old-school decor will take you back; the low-key vibe will make you linger. Rooms from $115, cabins from $160. RimRock Inn Tipis, rooms, and vintage trailers near Enterprise are the choices. The tipis overlook the canyon. From $125. Arrowhead Chocolates Get your morning Stumptown coffee fix with housemade whipped cream on request. Savory biscuits and chocolates (try the huckleberry) are made right there. 100 N. Main St., Joseph. Terminal Gravity Brewing Order a local beer and a Corriente beef burger and sit at the picnic tables in the yard. $; 803 S.E. School St., Enterprise. Imnaha Store and Tavern The fried chicken is a must—as is the fried chicken gizzards—in this 1904 building. Check out the rattlesnake jewelry sold nightly by Sallie Tanzey. $; 2 Hat Point Rd., Imnaha; (541) 577-3111. Little Bear Drive In The family that runs this roadside stand has been blending creamy milkshakes for four decades. $; 102 N. Madison St., Wallowa; (541) 886-3161. Silver Lake Bistro Wood-fired pizzas and calzones are made with local ingredients like foraged morel mushrooms. $; 19 S. Main St., Joseph. Stein Distillery Call ahead for a tour of the second-generation distillery of whiskey, bourbon, and vodka. 604 N. Main St., Joseph. Liza Jane’s Farmstand Meats, vegetables, eggs, honey, granola, and U-pick herbs are at the self-serve farmstand at 6 Ranch. State 82 in front of the McAlister Century Farmhouse, Enterprise. M. Crow & Co. Furniture-maker Tyler Hays sells high-end pieces through his East Coast design firm, BDDW. But he grew up in Wallowa County, and keeping this 109-year-old general store open is his investment in the community. 133 State 82/Main St., Lostine. Wild Carrot Herbals Plant goddess and owner Jody Berry grows many of the ingredients (arnica, yarrow, cottonwood) in her all-natural nutrient-rich body-care products. 114 W. Main St., Enterprise. Eagle Cap Wilderness With 50 glacial lakes, a mountain range, and wildflower-filled meadows, this area is nicknamed “Little Alps.” You can hike the Chief Joseph Trail from Wallowa Lake to gawk at a waterfall a little more than a mile in. Wallowa Lake Marina Located in the Wallowa Lake State Park and stocked with kokanee and rainbow trout. Kayak, paddleboard, or motorboat by the hour or day. From $15/hour; 72214 Marina Lane, Joseph. Hells Canyon Scenic Byway The 213-mile road encircles the Wallowa Mountains and can be done in five hours, but you won’t want to. The most scenic part is on Forest Service Road 39, between Joseph and Halfway. Zumwalt Prairie North America’s largest remaining Northwest bunchgrass prairie (240,000 acres) is a designated preserve and a place to catch heavenly light. Wallowa Lake Tramway Ascend 3,700 feet of Mt. Howard by gondola in 13 minutes. Enjoy Alps-like vistas from the top at 8,150 feet. From $31/day pass. Olaf’s Pottery Ceramist Ted Olaf Juve opens his studio in Alder Slope by appointment; you can see him work clay in his family’s 1886 farmhouse. 6 Ranch Fly Fishing Fly-fisherman James Nash guides guests on this stretch of the Wallowa River through the ranch. From $350/half-day. Josephy Center for Arts and Culture An art exhibit is held on the ground floor, while upstairs is devoted to the life of Alvin Josephy, an editor for Time magazine who was a prolific author on the subject of Native Americans and the West. The center hosts classes and events. 403 N. Main St., Joseph. Wallowa Band Nez Perce Trail Interpretive Center The Nez Perce tribe is the fabric of the community’s history. Their stories are told here through artifacts, photographs, and other displays. 209 E. Second St., Wallowa. Valley Bronze Gallery The bronze industry is big here. You can tour the foundry ($15; 11 a.m. daily) to see how pieces are cast in bronze. 18 S. Main St., Joseph.